Chances are, your local tailgate markets are brimming with leafy green offerings. Spring spinach is the quintessential nutrient-dense green on everyone’s table this season, but once you’ve had your fill of spinach salads, spinach quiches, creamed spinach, spinach omelet, then what? 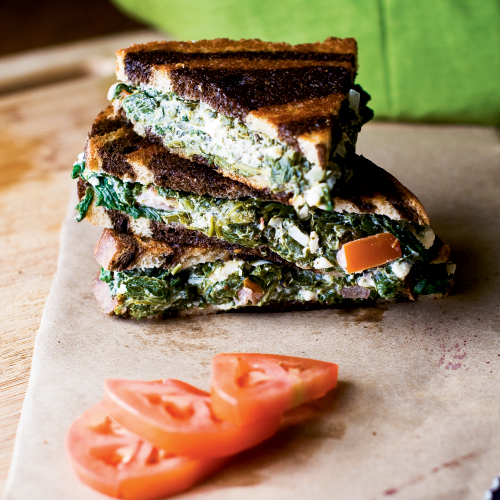 Here’s a simple and satisfying spinach melt sandwich recipe from Chef Bruce Brown, the gregarious owner of Bruce’s Fabulous Foods in Marion. Years ago, Brown was drawn to the simple beauty of a spinach sandwich he saw in a magazine—something that offered an alternative vegetarian option to a grilled cheese or tossed salad. “We just kept playing with different ingredients until we arrived at the combination we liked the best,” he says. “The originality of a spinach salad sandwich instead of the traditional salad is what makes it such a hit at our restaurant.” Many guests at Bruce’s even ask that their spinach melt be personalized by adding house-made pimento cheese or additional vegetables, such as roasted red peppers or sautéed mushrooms. Make the most of a bountiful spinach crop by freezing and storing leafy greens for later. Using leaves that are fresh and crisp, wash them in cold water and drain in a colander. Cut off stems and damaged parts. Blanch spinach in a pot of boiling water for two minutes, then plunge in a bowl of ice water to cool. Drain thoroughly. Place in an airtight bag and store in the freezer for up to 12 months.